It is a legacy of understanding and discovery, of peace-making and friendship...and now the job of carrying that legacy forward lies with all of us. The following article by Murray K. Watson, Ph.D., appeared in the final issue of Scarboro Missions magazine, September 2018. Respectful dialogue between and among different faiths is a relatively recent phenomenon. The concept would have made little sense to Fr. John Mary Fraser when he founded the China Mission College in 1919. Catholicism’s view of other religions tended to be clear-cut: “Outside the Church, there is no salvation.” The missionary mandate was primarily focused on preaching the Gospel and bringing non-Christians (thought of as “pagans”) to the light of Christian faith. Interactions with non-Christians generally had baptism as the hoped-for outcome. Those ideas would certainly have been part of Fr. Fraser’s vision. The fact that Scarboro Missions would eventually become such a focal point for interfaith dialogue, education and engagement, both nationally and internationally, is a testament to the transformation that took place in the Society’s own self-understanding—and in the Catholic Church’s thinking about missionary activity—especially in the wake of Vatican II. The terms of the conversation had changed dramatically. In the October 1990 issue of Scarboro Missions magazine, Jesuit Fr. Ovey Mohammed of Regis College wrote an article on “Catholicism and other faiths,” in which he offered an overview of how the church had grown in its thinking over the centuries. “Real commitment to faith,” he wrote, “belongs to the world of dialogue and collaboration, rather than to the sphere of judgement. Catholics must be willing to listen as well as to speak.” The great challenge, he said, would be to model an attitude of openness toward other faiths. In 1996, Scarboro Fathers John Walsh and Gerry Curry invited Paul McKenna, who had recently completed theological studies at St. Michael’s College, to collaborate with them in organizing events that could bring together members of faith communities in the Toronto area, under Scarboro’s patronage. Their first initiative was sponsoring two interfaith conferences to be held each year and rooted in the teachings of Mahatma Gandhi. The time had come to “institutionalize” interfaith as a formal component of Scarboro’s apostolate and an Interfaith Desk was created. Fr. Ray O’Toole was its inaugural director. Paul was a core element of the team, along with Deo Kernahan, a Trinidadian-born Hindu teacher, broadcaster and leading interfaith activist. Over the years, Frs. Terry Gallagher, Dave Warren, Mike Traher and other Scarboro missioners lent their support. When Deo died in 2001, the team lost a valued member. Paul McKenna, interfaith consultant and later director of the Interfaith Department, moderates questions to a multifaith panel. Scarboro Mission Centre, 1997. Seated behind Paul is Deo Kernahan, a valued member of the interfaith team. 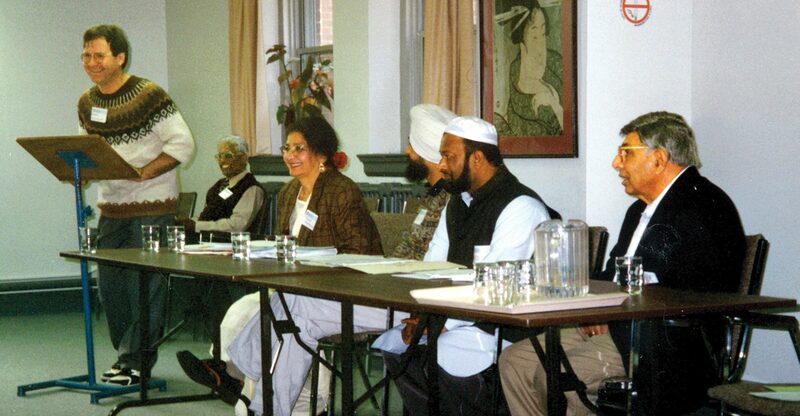 From 1996 to 2003, Scarboro Missions sponsored two conferences annually on using Gandhian nonviolent methods as an approach to interfaith dialogue. With the establishing of the Interfaith Desk in 1999 and later the Department of Interfaith Dialogue in 2001, Scarboro Missions was able to connect with local non-Christian communities, collaborate on educational or community-building events, and provide news, facilitation and resources related to interfaith topics. Paul McKenna, Scarboro’s long-serving interfaith consultant and later director of the Interfaith Department, played a key role in advancing interreligious discussions and learning, raising the profile of this part of Scarboro’s mission, and building bridges with local, national and international bodies. A review of the programs, publications and activities of Scarboro’s interfaith ministry reveals their breadth, relevance and prophetic character. They confirm the powerful impact this branch of Scarboro’s apostolate has had over the decades. In March 1999 the intersections of ecology and interfaith discussions were the topic of a Scarboro retreat. A few months later, the environment was again the focus at an afternoon of dialogue, drawing on interfaith wisdom as the world prepared to enter a new millennium. A six-week series of presentations on major world religions was also on Scarboro’s agenda that fall, culminating in Scarboro lay and priest missioners visiting a Hindu temple in Markham where they were given a warm welcome and a meal. Fr. 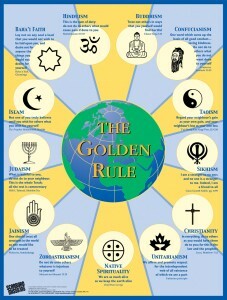 Gerry Curry presents the Golden Rule poster to Fr. Paul MacNeil and Sr. Millie MacNeil, a Sister of St. Martha, chaplains at St. Francis Xavier University, Antigonish, Nova Scotia. 2003. Launched in 2000, the poster has gained international recognition and is now available in 20 languages. Another key area of work for the interfaith team was to contribute material for Scarboro Missions magazine, and they coordinated seven special interfaith issues. For example, the February 1998 issue explored Catholic milestones in interfaith dialogue and how dialogue with Judaism, Islam and Buddhism was unfolding. It also featured interfaith ambassadors like Fr. Bede Griffiths and Mother Teresa. In a sad irony that no one could have foreseen, a special issue of the magazine in September 2001 highlighted the advances in interfaith conversation the same month that the 9/11 terror attacks brought Islam and the state of interreligious relations to the world’s attention. That magazine edition also highlighted the role of young people in interfaith conversation, a theme that would take on increasing importance in Scarboro’s interfaith work into the 2000s. World events had given a new impetus to what was already a significant aspect of Scarboro’s outreach work. A year after 9/11, Scarboro Missions’ focus was on “interfaith miracles,” on signs of hope and positivity at a very tense time in geopolitics. In his guest editorial, Paul McKenna pointed to Pope John Paul II’s Assisi interreligious gathering for peace in January 2002 as one of many good things happening around the globe. “The interfaith impulse is alive and well,” Paul wrote. “People of various religions are joining the interfaith conversation...More and more people are seeing interreligious sharing as a path to cooperative ethical action and harmonious community living.” In the shadow of such tragedy and violence, the Pope’s message was a welcome one and it hammered home the importance of what Paul and the Scarboro team were doing. As the 2000s progressed, Scarboro’s interfaith activity continued to expand, diversify and deepen. The department was participating in exciting interfaith activities that were contributing to a transformation in the Society’s self-understanding. 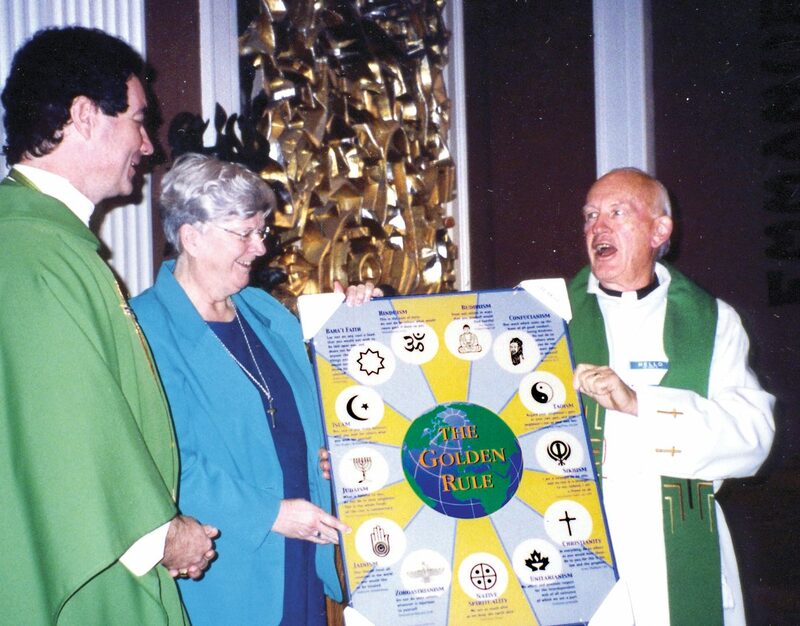 In 2004 Scarboro published another poster highlighting Catholic milestones in interfaith dialogue and summarizing the church’s major advances in the field in the past 50 years. The Scarboro Mission Centre became a hub of interfaith activity offering a wide-ranging series of evening talks. 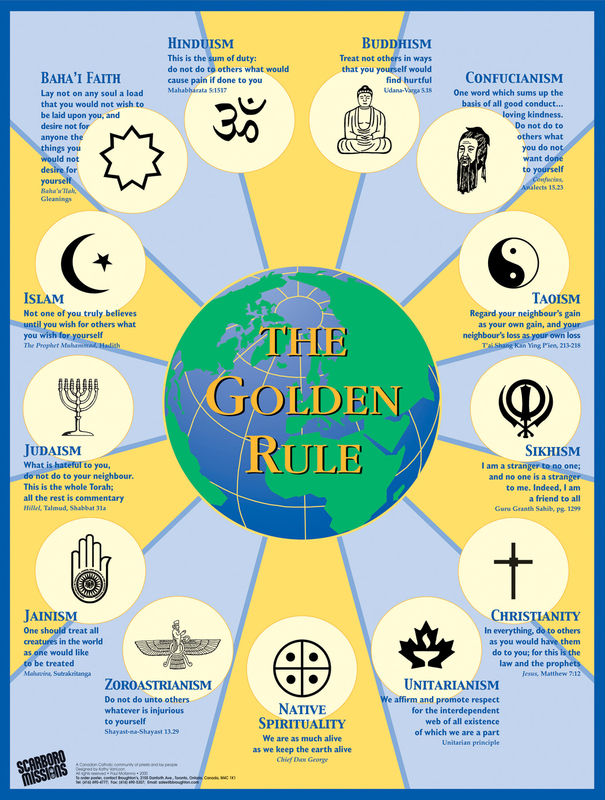 Jesuit Father Harry Gensler, one of the world’s top scholars of the Golden Rule, spoke about its importance—and its possible pitfalls. Another fertile area of interreligious outreach was with Catholic secondary schools. Under the gifted leadership of Kathy Murtha, coordinator of the Mission Centre, Scarboro provided a venue and a resource team to engage with tens of thousands of teenagers enrolled in the Grade 11 World Religions course at Catholic high schools throughout the Toronto area. Scarboro’s impact on young people is one of many ways in which the message of positive interreligious relationships was shared and modeled. Mission Centre coordinator Kathy Murtha and her team facilitated many new programs including Golden Rule retreats in collaboration with 35 Catholic high schools as part of their World Religions course. 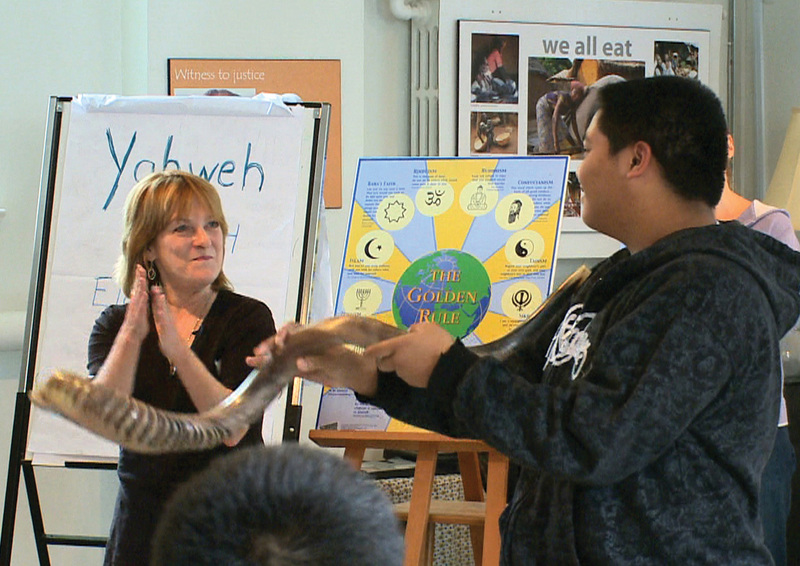 This student is learning about the shofar, an instrument made of ram’s horn and traditionally blown on Rosh Hashanah, the Jewish New Year. The addition of Sister Lucy Thorson of the Sisters of Our Lady of Sion to the team in 2008 brought new expertise in the area of Jewish-Christian relations. Sister Lucy organized a wide range of learning sessions exploring Judaism, Jewish worship, spirituality and ethics, and the remarkable changes that have marked five decades of Jewish-Christian dialogue. Working together with Shawn Daley (who was later ordained a priest for Scarboro) and University of Toronto graduate student Héctor Acero-Ferrer, Sister Lucy built bridges with the U of T student community and coordinated a number of sessions at the university’s Multi-Faith Centre, touching on contemporary issues of social justice through the lens of the world’s great faith traditions. Sister Lucy organized evening lectures on the theme of mercy in the three Abrahamic religions (featured in the April-May 2016 magazine edition), and built a network of connections with Toronto’s Jewish communities and their leaders. She and Héctor were key organizers of a major 2015 conference in Toronto celebrating the 50th anniversary of Vatican II’s ground-breaking declaration on non-Christian religions, Nostra Aetate. in so many ways, the energy, creativity and wisdom of the Scarboro team has been a catalyst for truly amazing interfaith progress. Tens of thousands of people near and far have benefited from this expertise and from the welcome Scarboro provided to people of all faiths to meet and to learn about and from each other. Perhaps what most amazed and inspired me, however, is the impressive roster of names of keynote speakers and partners, of authors, resource people and guests, who worked hand-in-hand with the interfaith team for more than 30 years. Scarboro’s events and initiatives provided a venue where a spectrum of voices could be heard and where a broad cross-section of human spiritual experience could be shared. An enormous pool of friends in the Toronto area and around the world have appreciated the inclusive vision that the Interfaith Department embodied. In an environment where interfaith groups and organizations tend to be very transitory, Scarboro provided a home—and funding—which allowed the Interfaith Department to be a stable and enduring presence, which in turn allowed it to foster trust and friendship. Dr. Murray Watson received his PhD in 2010 from Trinity College in Dublin, Ireland. He has taught Biblical Studies and ecumenical courses at St. Peter’s Seminary, London,Ontario. Since August 2013, he has been the director of French Biblical programs for the Ecce Homo Centre for Biblical Formation in Jerusalem. He is currently Assistant Professor of Religious Studies at Huron University College in London.